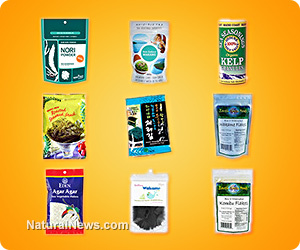 (NaturalNews) Continuing our mission to inform and empower consumers with heavy metals transparency for foods and superfoods, Natural News has just published heavy metals laboratory testing results for over 20 seaweed and sea vegetable products. All results are available at the Natural News Forensic Food Lab, which also publishes results for vegan protein products, breakfast cereals and more. If you've ever wanted to know the heavy metals content of seaweed snacks and sea vegetables sold by companies like Trader Joe's, Eden Foods, Kirkland and Maine Coast, results are now available showing concentrations of lead, cadmium, arsenic, mercury, aluminum, copper and even zinc (a nutritive mineral). As you can see from our results, there is a huge difference in concentrations of lead in seaweeds depending on the region from which it is harvested. For example, New Zealand Wakame turned out to contain zero lead, while the Fueru brand wakame seaweed from the Wel Pac company in China shows a whopping 0.851 ppm of lead. Fueru brand seaweed was also among the very highest in cadmium concentrations, although the cadmium levels we've found in some rice protein products were actually higher. As far as mercury goes, the highest level we found was in a kelp powder product, but most seaweeds were near zero on mercury concentrations (less than 10 ppb). Kombu flakes showed the highest arsenic concentrations among seaweeds, and the levels were quite substantial at over 100 ppm. Our tests do not differentiate between organic and inorganic arsenic, however. Copper was relatively low among most products, but the Kelp Help product showed copper at over 80 ppm which is the highest I've ever seen in any product tested so far (across all categories). However, the effects of this are sharply reduced by the high levels of zinc found in the product (see below) because zinc blocks copper absorption. For aluminum, Kelp Granules from Maine Coast were the highest by far at over 900 ppm. However, the dietary fibers of kelp are actually very good at binding to aluminum and retaining it during digestion. Our Metals Retention Factor tests showed that this 900 ppm of Aluminum in Kelp Granules was almost entirely retained by the kelp and not released during digestion. At the same time, Kelp Help was also highest in dietary zinc -- by far -- meaning this kelp is a very solid source of dietary zinc. And because zinc blocks copper absorption, this means the copper level of the kelp is not really much of a concern in this particular case.